Seventeen-year NBA veteran referee Violet Palmer is not the most obvious nomination for someone to be thankful for in sports this Thanksgiving. But her continued presence as the league's only female referee underscores how sometimes the best social experiments are the ones that quickly cease being seen as such. What gets exposed is how wrongheaded the logic or prejudices that were in play were in the first place. 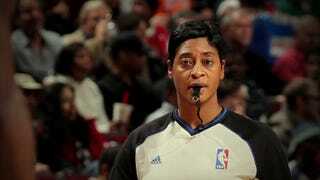 Palmer's gender was supposedly going to be a shock to sports establishment's system when she and Dee Kantner became the NBA's first female referees in 1997. Laughing, Palmer said, "Oh yes, we heard it all." But Palmer has found a way to keep vaulting lightly over the cynicism. Kanter left the NBA after five years, in 2002, but Palmer has lasted long enough to finally see more female officials coming up in the pipeline behind her, thanks in part to how well she has paved the way. "Two more women have already been working two or three NBA games a month this season as on-the-job training that will go through January," Palmer said of Brenda Pantajo and Lauren Holtkamp. "And I'm not sure anyone even noticed much. Which is great."